Businesses today take advantage of commercial projector systems in conference rooms, lunch areas and break rooms, and even in lobbies. Most commercial projector systems are set up with a big screen TV that can also get cable TV while the projector is not in use. 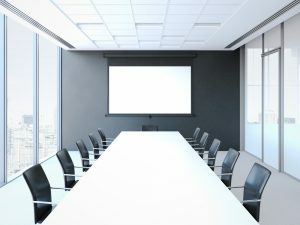 Even with VOIP telephone systems, such as Skype or other built-in computer communications, such as Google Hangouts, the need for a commercial projector system is still a necessity for many businesses. But where do businesses go to find installation and tech support for these types of systems? Read on to learn more about commercial projector installation and repair service in Jurupa Valley. It goes without saying that communications systems are one of the most important tools used in business today. Not only is the setup and installation of these types of systems crucial, maintaining and establishing robust communications systems are at the top of many executives’ priority lists. Working with a reputable service technician on the installation, service, and maintenance of a commercial projector and communications system is important. Working with an experience team of tech professionals and engineers will ensure a quality system over the long term. Our installation experts are extremely knowledgeable and proficient in installing and setting up various audio and video systems, including commercial projector systems. Even if your business is unsure of the type of network design or audio and video system that is needed in your office, working with one of our team members will help. Part of the Empire guarantee to our customers is to provide the best possible solutions to better serve customers while also saving them time and money. Call Empire Technologies today at (909)321-2570 to learn more about commercial projector installation and repair service in Jurupa Valley and for a free quote.